Since a previous post has recently come in for some criticism by an expert on the subject, I am reposting it here, along with the comment; then in my next post I will address the criticism. In the meantime, I invite other readers to also comment on it as well. Mr. Stephen Hood has recently published a new biography of General John Bell Hood which promises to be a major revision of the accepted views of the general’s leadership with the Army of Tennessee. On November 30, 1864, one of the bloodiest battles of the Civil War, The Battle of Franklin, was fought a few miles south of Nashville, Tennessee. Although the Battle of Nashville followed a few weeks later, Franklin was in fact the Confederacy’s last hurrah, when they still had a glimmer of hope of turning the war around. To understand what happened, however, we need to go back a few weeks, when Confederate General John Bell Hood finally moved to invade Tennessee. Hood hoped to take Nashville, destroy the Union Army there and force General Sherman to turn around and chase after him; after that, who knew–Louisville, the Ohio Valley and beyond. Perhaps under a brilliant tactician like Stonewall Jackson, this grand strategy might have had a chance of succeeding. But Hood was no Stonewall and Lee’s right arm had died at Chancellorsville. After much delay and disorganization, Hood began to move North. 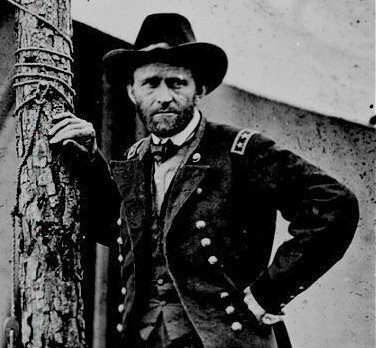 Sherman, however, refused to play Hood’s game and gave responsibility for stopping him to General George Thomas and the Army of the Cumberland. Thomas was in fact one of the South’s greatest generals–save for the fact that he sided with the Union. A Virginian by birth, he chose his nation over his state and fought ably and well throughout the war. But Thomas needed time to gather his troops together behind Fortress Nashville, with its multiple forts and redoubts. In turn, Thomas turned to General Schofield to not only gather two corps to his command and also to hold back Hood as long as possible. 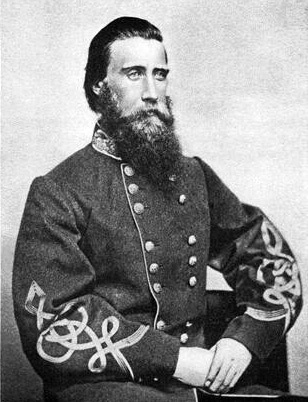 General John Schofield, commander of Union forces at Franklin and a former classmate of General Hood. It is not generally appreciated to this day the difficulty under which General Schofield labored. Hood was nothing if not aggressive and he saw in Schofield’s small army an opportunity to defeat the Yankees piecemeal. Schofield, for his part, had to both keep from being cut off and yet hold Hood back as long as possible–no easy task. Gathering the IV and XXIII Corps near Pulaski, Tennessee, Schofield first raced to beat Hood to Columbia, Tennessee on the north side of the Duck River. For several days he entrenched there as Hood brought his army up and then sought to outflank Schofield and cut off his line of retreat. Even after his position had become untenable, Thomas continued to urge Schofield to hold onto the bridgehead over the Duck River at Columbia. 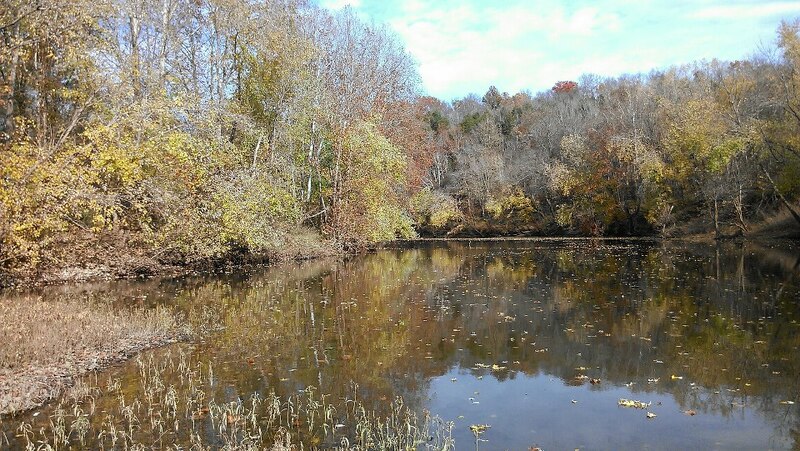 Davis’ Ford across the Duck River, where Hood’s army crossed, outflanking Schofield’s army. 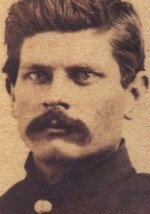 Lieutenant Ambrose Bierce, taken some time in 1863 or 1864. Bierce fought in nearly every major battle in the Western Theatre and was eyewitness to both the Battles of Franklin and Nashville. Apparently, it was also unnerving for Hood to see the Yankees watching his army cross over the Duck River, so he dispatched a large part of his force to guard his left flank while the remainder of the army marched straight on to Springhill, which lay along the main road north. Schofield’s rear guard was still holding Columbia even as his advance guard raced to Springhill to keep Hood from cutting them off. It was a very near thing and Schofield’s force just barely beat off the repeated Rebel attacks on November 29. Had Hood not diverted part of his force to guard his flank, it is likely that the outcome of the battle at Springhill might have been different. Even though Schofield’s force repulsed Hood’s advance guard, by nightfall the entire Rebel army was sitting astride the road to Nashville. On the morrow, Hood fully believed he would either destroy the Yankee army or force it to surrender. But something strange happened; the next morning Hood awoke to find the Yankees had disappeared in the night! Furious, Hood fumed and fussed and cursed and blamed everyone but himself. Marching north in hot pursuit, Hood had but one idea in his mind: attack! By late on the afternoon of November 30, The Army of Tennessee was lined up as on a parade–all except for their artillery train and cavalry. As he got the bulk of his force across the Harpeth River north of Franklin, Schofield’s rear-guard dug in south of the city. Schofield gave his rear guard orders to withdraw by six pm if they were not attacked. 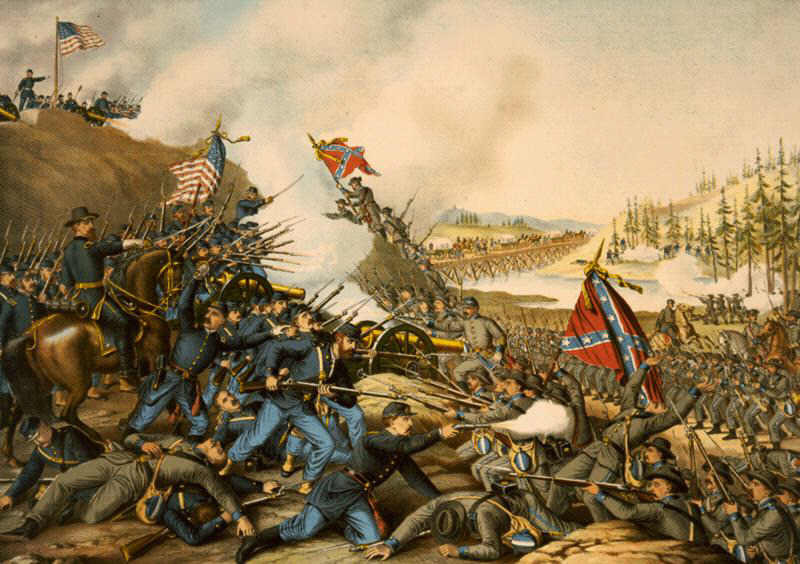 Around 4:30 pm the Confederates attacked the entrenched rear-guard. By the fall of 1864, the Confederate Army of Tennessee and the Union Army of the Cumberland were the best of enemies. They had fought one another from Kentucky to Georgia and back again and each army full well knew the measure of the other. Both sides knew better than to launch a frontal assault against an entrenched foe. The Federals had learned that lesson well at Kennesaw Mountain earlier in the year. But Hood ordered his army to march across a barren plain in full sight of a well entrenched enemy. Everyone in the Army of Tennessee knew it was folly–all except General Hood, their commander. Actually, Schofield feared the Rebel cavalry fording the Harpeth River and cutting off his line of retreat far more than an infantry frontal assault. But Hood could think of but one thing: attack the enemy to his front. All subtlety of maneuver or outflanking tactics were lost on Hood. In the end the Battle of Franklin was as bloody as it was unnecessary; Hood could have destroyed Schofield had he trusted his cavalry to do its job. Yet, due to the gallantry of his officers and men, the initial assault on the Union line came very near to succeeding. However, by nine that night, thousands were dead on both sides; the Yankees could afford to lose them; Hood could not. He lost five of his best generals and some twenty regimental commanders, plus thousands of others killed or maimed. The Battle of Franklin, September 30, 1864, as imagined by Kurz and Allison printmakers. Although Hood was in possession of the battlefield of Franklin, yet still it could be counted a defeat for him. 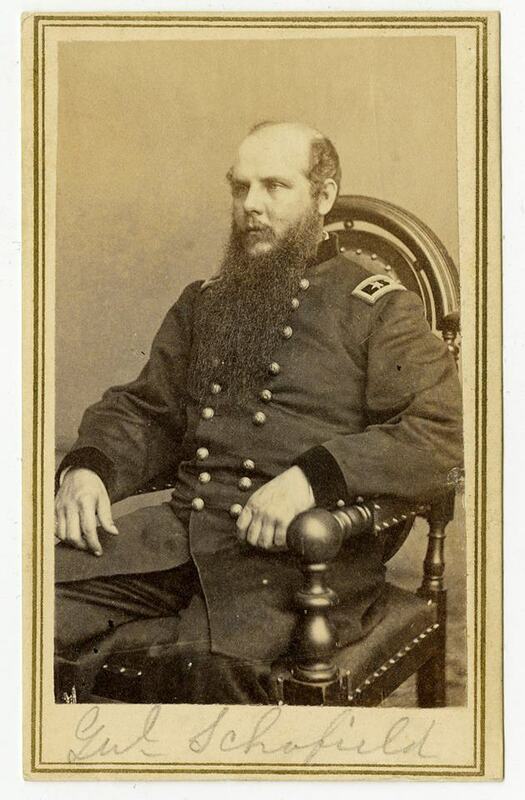 But the man who defeated General Hood was not his old West Point schoolmate Schofield; it was Hood who defeated Hood. Grant in the field late in the war. Although most historians do not believe that Hood had a credible chance of capturing Nashville, Grant and the rest of the Lincoln administration were gravely concerned at the possibility. Grant badgered Thomas to attack and was on the verge of replacing him when news of his triumph at Nashville arrived. Mr. Coleman is author of two books relating to the Civil War currently in print; his next book will deal with Ambrose Bierce’s wartime experiences as a soldier in the Army of the Cumberland. My name is Sam Hood, and as my name implies, I am a relative of Gen. John Bell Hood, but not a direct descendent, rather, a second cousin. I have written a book titled “John Bell Hood: The Rise, Fall, and Resurrection of a Confederate General” (Savas Beatie 2013). There are numerous assertions in your article that have no historical evidence; you seem to be repeating eloquently expressed opinions of later authors such as Thomas Connelly and Wiley Sword. My book is heavily footnoted (approx. 1,000) and I provide mostly primary sources. You might find it interesting and informative. My publisher provides readers an entire chapter (Battle of Nashville) free on the http://www.savasbeatie.com web site. Although the chapter is not on Franklin, you can get a feel for how the rest of the book is researched and written.